The Signal Source Noise Control & Signal Processing Experts. These innovative voltage-controlled oscillators make the most of multi-coupled slow-wave planar resonators to achieve low phase-noise performance at a fraction of the size and power of YIGs. Phase noise is the curse of many a communications system, and one of the key performance parameters that most oscillators strive to minimize. System designers have long recognized the yttrium-iron-garnet (YIG) oscillator for its broadband, low-noise, high-frequency capabilities. But YIG sources are also power hungry and physically large. The mechanical design, with a YIG sphere mounted in the air gap of an electromagnet, is not conducive to integrated-circuit (IC) integration. And the sphere placement and tolerances required do not lend to high-volume production. The size of the sphere and the windings used for the electromagnetic field become prohibitive at resonance frequencies below about 2 GHz. In addition, YIG oscillators are sensitive to thermal drift, vibration, lighting, electromagnetic interference (EMI), microphonics, phase hits, and frequency modulation, all of which have a detrimental effect in designing modern communication systems. Fortunately, there is now an alternative source for tunable high-frequency signals with low phase noise: the distributed coupled YIG-replacement oscillator or DCYR series from Synergy Microwave Corp. (Paterson, NJ). The new patent-pending voltage-controlled oscillators (VCOs) are currently available for frequencies from 250 to 6000 MHz with typical measured phase noise of -132 dBc/Hz offset 100 kHz from carriers 250 to 1000 MHz. In spite of their low phase-noise levels, it is a YIG oscillator's sensitivity to drift, vibration, and other negative factors that can diminish a microwave radio's bit-error-rate (BER) performance. 1- 10 YIG oscillators are also limited in tuning speed in the range of millisecond frequency switching speed. For point-to-point and point-to-multi-point radio designers, the microsecond switching speed of a VCO supports frequency-agile solutions, although the phase noise of source agile sources has traditionally been limited. With the new DCYR sources, the phase-noise performance is comparable to the best YIG sources over wideband tuning ranges, but at a fraction of the size and power consumption, and with considerably faster tuning speed than YIG oscillators. YIG oscillators require a significant amount of power (typically 200 mA at 12 V or more) in order to power the heater that stabilizes the internal temperature of the YIG sphere and its supporting electronics. Dissipating this heat often becomes a problem, especially when protecting the surrounding circuitry of a microwave radio. Even with the integrated heater, the operating temperature range of most YIG oscillators is limited to about 0 to +60°C and not suitable for all wireless systems. The design of one YIG oscillator is not readily scalable to a nonstandard package or frequency range, so custom YIG sources generally require additional non-recurring-engineering (NRE) costs along with the costs of the products. Another limitation of the YIG oscillator is the nature of its tuning, by means of an applied magnetic field. Instantaneous changes to that field are difficult to control, and creating the structure to generate such a field is not readily compatible with low-cost monolithic-microwave-integrated-circuit (MMIC) fabrication techniques. A YIG oscillator is essentially a YIG sphere with high unloaded quality factor (Q) set in a resonant cavity. The resonant frequency is tuned according to the magnetic field applied by a main coil. A second magnetic field, applied from a second coil, provides modulation when necessary. And a heating element is often added to stabilize the frequency of the YIG sphere and resonant structure over wide temperature ranges. The traditional design of a YIG sphere and resonant cavity becomes significantly larger as wavelengths become larger, typically at frequencies below 2 GHz. Few advances have been made in this basic proportionality rule, resulting in few commercial YIG sources for frequency ranges below 2 GHz. An MCSW VCO is planar and broadband in nature, therefore well suited for cost-effective, monolithic-microwave-integrated-circuit (MMIC) fabrication. With the potential to enable wide operational bandwidths, eliminate discrete resonators (such as a YIG sphere), and produce high-quality-factor (high-Q) planar resonators for low-noise VCOs by means of a planar fabrication process compatible with existing IC and MMIC processes, the MCSW VCO is a promising technology for present and future broadband communications requirements. The MCSW, for example, is well suited for use in microwave communications systems, test equipment, radar, local multipoint-distribution systems (LMDS), and multichannel multipoint-distribution systems (MMDS). Figure 1 shows a block diagram of a DCYR series MCSW VCO. The DCYR series is currently available at frequencies from 250 to 6000 MHz (various tuning ranges); all models are capable of providing stable performance over wide operating temperature ranges of -40 to +85°C. The tiny low-noise oscillators are housed in surface-mount packages measuring either 0.5 0.5 0.16 in. or 0.75 0.75 0.16 in. (Fig. 2). These miniature sources are a fraction of the size of the smallest YIG oscillators, which are housed in metal cubes measuring either 1 in. or 1.25 in. on a side. How well does this arrangement perform in terms of phase noise? As a reference point, the typical phase noise of a commercial YIG-tuned oscillator is -95 dBc/Hz offset 100 kHz from carriers spanning 2 to 6 GHz. In recent years, commercial YIG oscillators have been developed with frequency coverage as low as 500 MHz in multi-octave 1-in. units, although maintaining a miniature package style at lower frequencies becomes difficult. In spite of the small size, the power consumption for these units, with the combined oscillator circuit and YIG heater requirements, can exceed 200 mA on surges and 100 mA in steady-state operation. In comparison, Fig. 3 shows the phase-noise plot of a 250-to-1000-MHz model DCYR 25100-5 oscillator. The typical measured phase noise is -130 dBc/Hz at offset 100 kHz from the carrier. The oscillator is smaller than the tiniest YIG source, at 0.75 0.75 0.16 in., and requires only 35 mA current at +5 VDC, with a tuning voltage range of 0 to 28 V. The buffered output power is more than +3 dBm across the full 750-MHz bandwidth (4-octave), with harmonic levels of better than -20 dBc across the full band. In contrast, wideband YIG oscillators can provide more output power, at levels of +10 dBm or more at even higher frequencies but at the cost of high power consumption and harmonic levels tend to be in the range or -10 dBc or worse. A variation, model DCYR 25100-12, at 0.75 X 0.75 X 0.16 in, 35 mA current at +12 VDC, with a tuning voltage-range of 0 to 28 V offers typical measured phase noise -134 dBc/Hz at offset 100 kHz from the carrier. Figures 4, 5, and 6 show the plot of phase noise, frequency tuning, output power, second-harmonic rejection for model DCYR 25100-12. Model DCYR 100200, covers the octave band from 1000 to 2000 MHz with better than -128 dBc/Hz offset 100 kHz from the carrier. It is supplied in a surface-mount package measuring 0.75 X 0.75 in. It exhibits second harmonics of better than -10 dBc. The sources consume 35 mA at +12 VDC and output power is better than +3 dBm across the full tuning band. A variation, model DCYS 100200-12, measures 0.5 0.5 in. Model DCYR 300600-5 covers 3000 to 6000 MHz with a tuning voltage range of 0 to 25 V and power supply of 45 mA and +5 VDC. It measures 0.75 X 0.75 and exhibits phase noise of -105 dBc/z offset 100 kHz from the carrier. Second harmonics are -10 dBc or better. The 0.5 X 0.5-in. version is model DCYS 300600-5. Model DCYS 200400-5 covers the octave band from 2000 to 4000 MHz in a 0.5 X 0.5-in. package. The typical phase noise is -113 dBc/Hz offset 100 kHz from the carrier with second harmonic levels of -10 dBc or better. The buffered output power is +3 dBm or more across the full band and excellent linearity (typically 1:2). Power requirements are 45 mA at +5 VDC, with tuning voltages of 0 to 15 V.
Model DCYS 250500-5 tunes over the octave band of 2500 to 5000 MHz in a package measuring 0.5 X 0.5 in. Its typical phase noise is -105 dBc/Hz offset 100 kHz from the carrier with second harmonics of -10 dBc or better across the full band. The oscillator requires tuning voltages of 0 to 20 V and consumes 45 mA at +5 VDC. It delivers better than +3 dBm buffered output power across the full tuning range. Finally, model DCYS 300600-5 tunes from 3000 to 6000 MHz with typical phase noise of -102 dBc/Hz offset 100 kHz from the carrier and harmonics of better than -10 dBc across the full band. The oscillator measures 0.5 X 0.5 in., has a tuning voltage range of 0 to 25 V, and draws 45 mA current from a +5-VDC supply. It offers better than +3 dBm buffered output power across the full tuning range. Obviously, for microwave frequencies, YIG oscillators still provide the best combination of multi-octave tuning range and phase noise, albeit requiring moderate to high power levels to handle tuning and YIG heater elements. 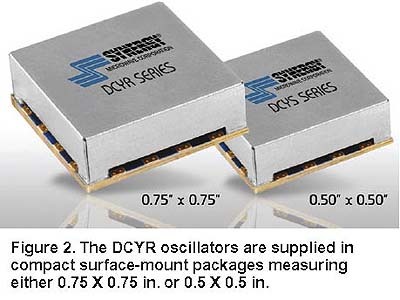 For frequencies as low as 250 MHz and as high as 6000 MHz, however, the new DCYR oscillators offer a low-phase-noise alternative to YIGs and other sources at these lower frequencies, with less susceptibility to vibration and microphonics, less power consumption, and smaller size. And for applications requiring agile frequency switching speeds, the new oscillators offer the potential of microsecond switching speed for ultrawideband (UWB) and other emerging wireless applications. A.K. Poddar, "A Novel Approach for Designing Integrated Ultra Low Noise Microwave Wideband Voltage Controlled Oscillators," Dr.-Ing. Dissertation (Ph.D. thesis) TU-Berlin, 14 December 2004, Germany. U.L. Rohde, A.K. Poddar, J. Schoepf, R. Rebel, and P. Patel, "Low Noise Low Cost Ultra Wideband N-Push VCO," IEEE MTTS, 2005, USA. A.K. Poddar and K.N. Pandey, "Microwave Switch using MEMS technology," High Performance Electron Devices for Microwave and Optoelectronic Application, 8th IEEE International Symposium, pp.134-139, Nov. 2000, UK. U.L. Rohde, A.K. Poddar, and Juergen Schoepf, "A Unifying Theory and Characterization of Microwave Oscillators/VCOs," 18th IEEE CCECE05, May 2005, Canada. U.L. Rohde, K.J. Schoepf, and A.K. Poddar, "Low-Noise VCOs Conquer Wide Bands," Microwaves & RF, pp. 98-106, June 2004. A.K. Poddar, S.K. Koul and Bharthi Bhat, "Millimeter Wave Evanescent Mode Gunn Diode Oscillator in Suspended Stripline Configuration," IR &MM Wave, 22nd International Conference, pp. 265-266, July 1997, USA. U.L. Rohde, A.K. Poddar, and G. Boeck, Modern Microwave Oscillators for Wireless Applications: Theory and Optimization, Wiley, New York, 2005. A.K. Poddar, J.K. Bansal, and K.N. Pandey, "Millimeter Wave Evanescent Mode Power Combiner-Gunn Oscillator in Suspended Stripline Configuration," Mathematical Methods in Electromagnetic Theory, IEEE-MMET'98 International Conference, pp. 384-386, June 1998. U.L. Rohde and A.K. Poddar, "Reconfigurable Wideband VCOs," IEEE, PIMRC2005, September 11-14, 2005, Germany. U.L. Rohde and A.K. Poddar, "Distributed Coupled Resonator (DCR) Oscillator/VCO Limit Phase Noise and Phase Hits," IEEE Radio and Wireless Systems Symposium, January 17-19, 2006, USA. U.L. Rohde and A.K. Poddar, "UWB Configurable YRO," IEEE Sarnoff Symposium, Princeton, March 27-28, 2006, NJ, USA. U.L. Rohde, and A.K. Poddar, "Cost-Effective, Power-Efficient and Configurable YIG Replacement Signal Source," German Microwave Conference-GeMiC 2006, 28-30 March 2006, Germany.